As tension and protests sweep through St. Louis in the aftermath of the Jason Stockley verdict, restaurant owners in the city were infuriated when “Whites Only” stickers with the hashtag #BLM began surfacing at local eateries. They understood the anger and protests but wondered why anyone would fan the flames with such an incendiary act. Turns out, some white boys did it. According to Newsweek, the Grove district in St. Louis is a diverse area and home to a large selection of bars and restaurants. On Tuesday night, someone placed stickers that simply read “Whites Only” on businesses in the area, upsetting both owners and patrons. In the corner of the stickers was the hashtag #BLM, often used by the Black Lives Matter movement. Mysterious perpetrators placed the signs on businesses late Tuesday night. Shockingly, the people who committed this ignorant act were not equipped with the foresight and intelligence to assume that some of the restaurants were equipped with surveillance cameras. When police examined the footage, they discovered that the act of vandalism was committed by—you guessed it—a group of white guys. 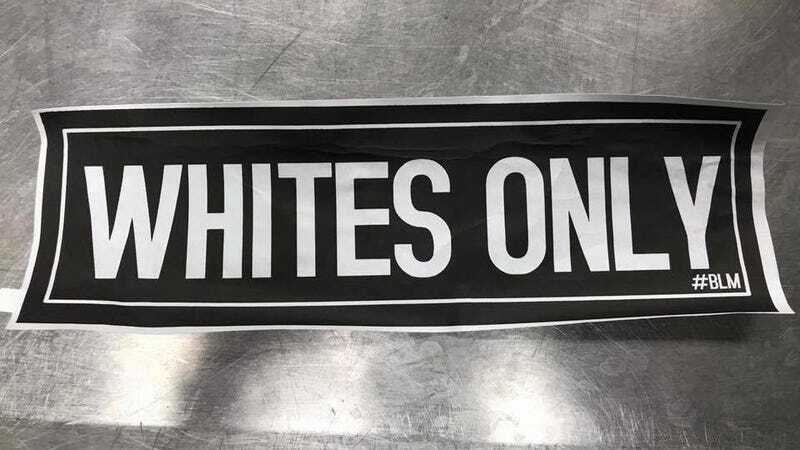 The video, obtained by television station KMOV, shows what police say appears to be a group of Caucasian males placing the stickers on doors and windows in the area. The area is 55.8 percent white and 37.2 percent black, according to the U.S. Census Bureau. The Grove contains businesses owned by people of a variety of nationalities and races, including whites, African Americans and Koreans. Many of the business owners did not think the stickers were the work of Black Lives Matter, but wondered what kind of people would think it was a good idea to inflame hate and hide their hateful hands. I thought we went over that part: white boys. Police say they are looking into the matter, but they are probably kinda busy right now with the protests. As soon as the turmoil is over, one would assume they would resume their usual activities of investigating crimes and shooting people. Read more at Newsweek and KMOV.